The house located at this site before the fire was built in 1803 by Capt. Lot Luce (c.1760-1824) and inherited by his son-in-law Capt. Ebenezer Allen Smith (1791-1833). It was later bought by Henry Pease Worth, and in 1879 Worth's heirs sold it to John H. Lambert, who was living in it at the time of the 1883 fire. Henry Pease Worth (1794-1878), born in Edgartown to Capt. 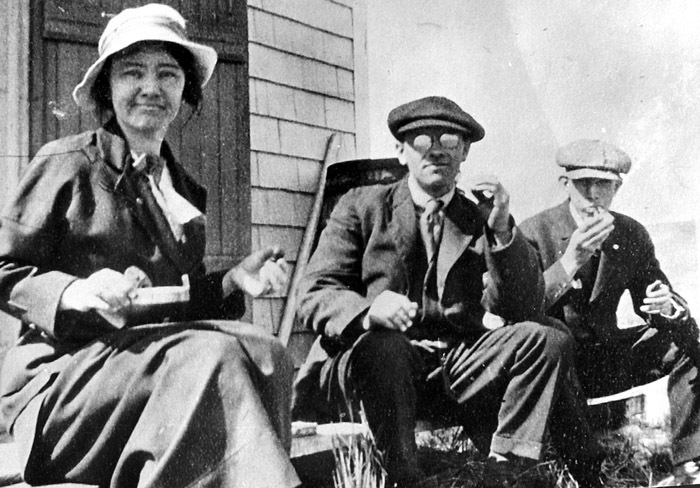 Jethro and Velina (Pease) Worth, was the customs house officer for the port of Holmes Hole, and kept an office in or immediately adjacent to his home at this site. He was married to Mercy Banning (1794-1861) of Edgartown. Dr. Banks writes of the Customs Service in Tisbury: "In 1817 Homes Hole was made a sub-port of entry for Edgartown, in consequence of the growth of this place as a maritime centre. Henry Pease Worth was the first Deputy Collector, under appointment dated Nov. 29, 1817, and he held this position nearly fifty years. ... He was succeeded, June 17, 1861, by Capt. Henry W. Beetle, a native of New Bedford, who held the office for nearly thirty years, until his death." Rev. Luce, in his boyhood memories published in the Gazette (1923), writes that Mr. Pease "had a small two-masted revenue boat, with which it was his duty to visit every morning, every vessel that had dropped anchor the night before. His mate for several years, was Capt. Lot Luce `Uncle Lot', everybody called him. He was also the mate of Mr. Worth's successor, Capt. Henry Beetle." In December 1879 John H. Lambert bought this property at auction from the estate of Henry P. Worth for $925. Less than four years later, the home burned to the ground in the 1883 fire. Newspapers reported that John Lambert lost a dry goods store "next to the Baptist Church" to the fire, as well as a "fancy store." In September 1883 the Gazette reported that "John H. Lambert is preparing to build a store for his business on the lot where his residence stood." but there is no evidence this building was raised, and the lot was apparently left vacant for nearly a decade afterwards. Capt. Worth's home, presumably also the Customs House office, is visible on the right in this photo taken before the fire. 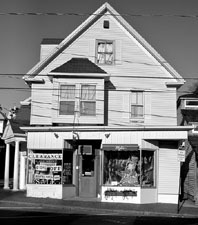 Stan Lair said: "Next was H. L. Tilton's Stoves and Ranges, and he had a plumbing shop in the rear. The front was later a drug store and ice cream parlor. Big Hutch and Little Hutch, two very popular clerks, worked there for many years. The plumbing shop was later taken over by Lester Bumpus, for whom I worked until his death by drowning in 1925. I recall that day very well. He had worked that day on a gasoline tank on a speedboat. The name of the speedboat was Jazz, owned by the Whitney Family, and he told me that day that after he installed it he was going to have a ride that evening. Well he did - they went out in the harbor that evening. They had a lot of children aboard also. He hit a swell from the steamer coming in, and it threw all the people out of the stern of the boat. Threw them right out, and Jack went down, and he was never seen again. Well, they found him of course, but he didn't come to the surface. All the children were swimmers, so they survived. That was in 1925. And the business was operated for a short while after that by H. N. Hinckley, and then it was bought by Jack Hughes. 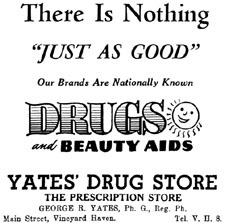 It is now Yates Drug Store." 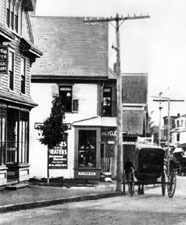 Tilton's plumbing shop, c. 1894. 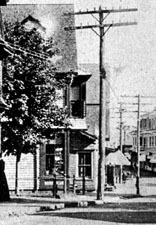 Neighboring on the north side is Ben Dexter's store, including the barber shop and the WCTU Reading Room. SL: He ran what is now Yates Drug Store. Before it was a drug store, he sold stoves and he had a plumbing shop in the rear of the place. Lester Bumpus was one of his men. I think Fred worked there, Fred Peakes, and a lot of other people. Jack Bumpus - Lester Bumpus - eventually took it over, and then Mr. Tilton turned it into a drug store, the front part of the building. That's where Big and Little Hutch first started their careers, I guess. And he lived in that big house, overlooked Cat Hollow. Tuttle lives there now, I think. Great big house. Overlooks the harbor, too. BW: Sits in back of the Martha's Vineyard Funeral Home, there. SL: Up near the old cemetery. The Tiltons moved to Vineyard Haven when Herbert was sixteen. 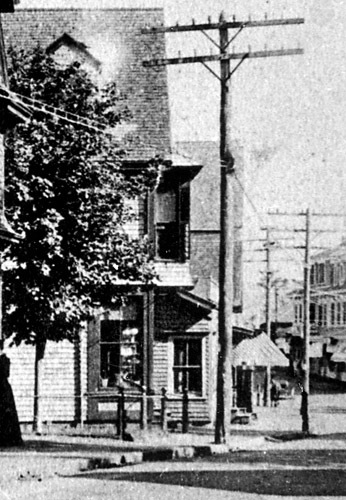 In June 1886 Herbert Tilton took over management of Benjamin Dexter's ice cream saloon at the corner of Main and Centre streets (See Site #26). Tilton ran this business for two years, and in September 1888 the Gazette reported that "Howard M. Smith has bought out the business of H. L. Tilton. H. L. Tilton goes to New Bedford next week to enter the employ of Wood, Brightman & Co." He worked in New Bedford for four years as a plumbers apprentice. 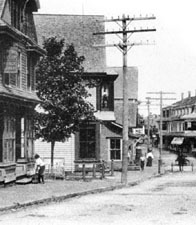 In August 1892, John H. Lambert sold this empty lot on Main Street to Owen H. Tilton (1836-1901) of Tisbury, and the following month, the Gazette reported that "Ground is broken for the new business building to be erected for Mr. O. H. Tilton on the lot on Main Street, south of the Reading Room. 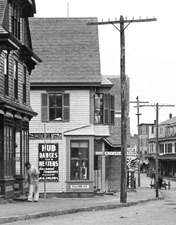 The first floor, it is reported, will be occupied by Mr. Tilton's son, Mr. Herbert Tilton, of New Bedford, who will carry on the plumbing business here." By September, it was reported that work on Capt. O. H. Tilton's new building was progressing, and in November 1892, H. L. Tilton opened a plumbing and steamfitting business at his new Main Street store. In December 1896 it was reported that A. F. Cummings was employing H. L. Tilton as his agent for the water company. 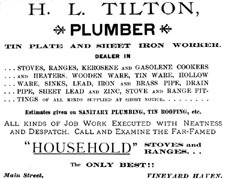 The 1897 directory lists plumber H. L. Tilton as a "Tin Plate and Sheet Iron Worker dealer in Stoves, Ranges, Wooden Ware, Tin Ware, and Kitchen Furnishings. Bicycle sundries and repairing." In 1901 Herbert's father Owen H. Tilton died, and his brother F. O. Tilton took over their father's lumber, lime, and cement business. 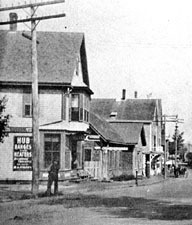 In 1902 the Gazette reported that Herbert Tilton's store was lit up "prettily" with acetylene gas, and in September 1904 the town licensed H. L. Tilton to store metal cans of gasoline in rear of his store. 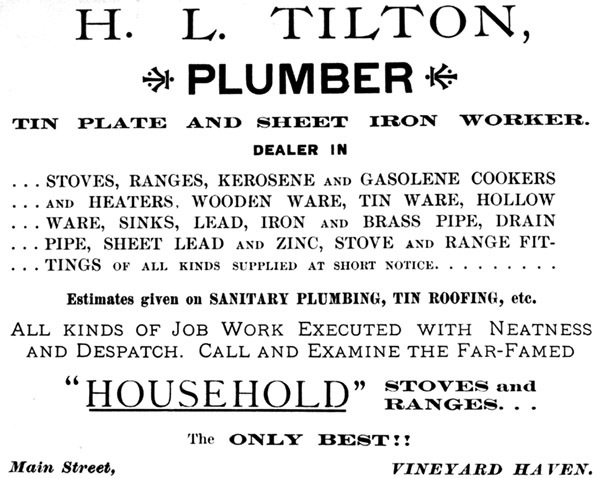 The 1907 Vineyard Haven directory lists Tilton's store as "plumber and kitchen furnishing" and as employing Herbert Aspey, Jack Beede and Lester Bumpus, plumbers. He had a similar listing in 1910, and plumbers Lester Bumpus and Thomas Dewson are listed as his employees by this time. In 1908 Tilton enlarged his store and workshop to "nearly double its size." Herbert L. Tilton continued to be listed as a "plumber" in the April 1910 census, and the April 1910 receipt on the right shows that H. L. Tilton had also become the superintendent of the Vineyard Haven Gas + Electric Light Co.
H. L. Tilton Storefront, c. 1909-19. Notice the pipes stacked on the left of the store. Frank Downs' Harness Shop is on the right. Notice the addition of a dormer window behind the tree - perhaps in the 1908 renovation? 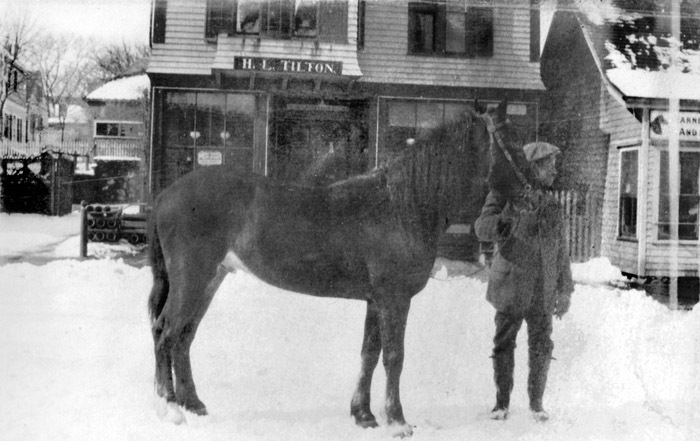 In October 1912, H. L. Tilton sold part of his stock to his brother, hardware store owner Ernest Tilton. In May 1913, Frank O. Tilton and Ernest R. Tilton, heirs to their father Owen H. Tilton's estate, sold their interests in this building and lot to their brother Herbert. 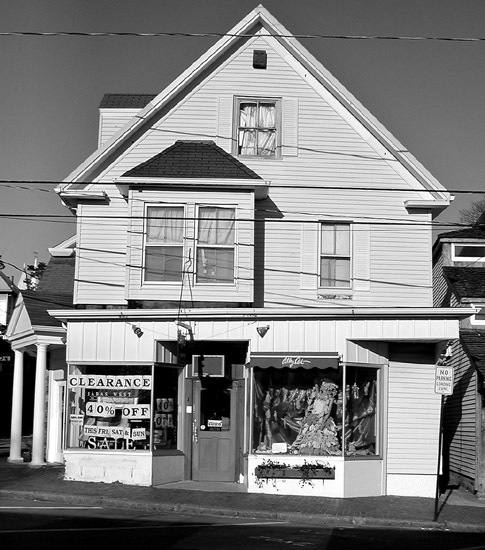 At about this same time, Herbert Tilton turned over the plumbing business to his employee Lester Bumpus perhaps partly because he was competing with his brother Ernest's hardware store down the street (See Site #29.) The 1914 Sanborn map lists Herbert Tilton's store as a drug store, with Bumpus' plumbing shop in the rear. The January 1920 census lists Herbert L. Tilton, aged 50, as a "druggist." 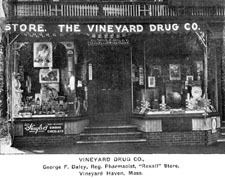 In October 1922 the Gazette reported that "Returns from the World Series are being received by radio by the Vineyard Drug Co. at Vineyard Haven this year. The score is sent inning by inning. The result of the first game reached Vineyard Haven about 4:15 yesterday." 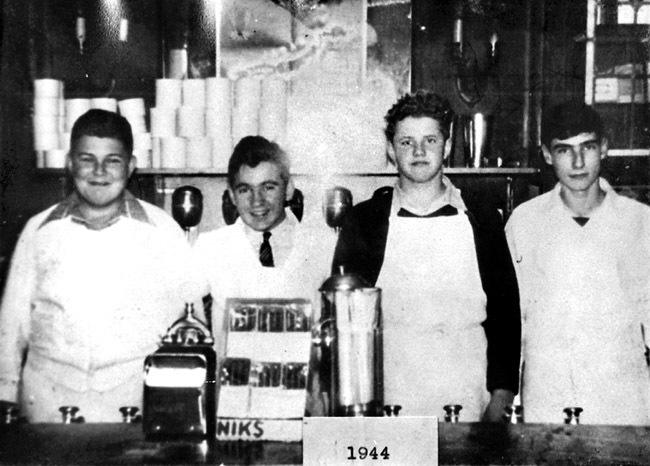 In December 1923 the Vineyard Drug Co installed a modern soda fountain for serving ice cream and sodas. In 1924 H. L. Tilton's Vineyard Drug Co. advertised medicines, toilet articles, candies, sodas, and smokers' materials. 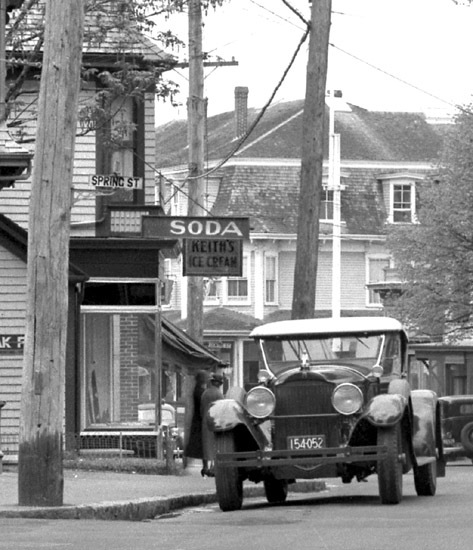 In February 1925 town records show that Tilton borrowed money from the bank to buy a $1590 electric refrigerating machine with a soda fountain and a six-hole ice cream cabinet. Stan Lair wrote on the back of this photo: "Shown at O. B. Waiting Room - Now Big Bellies Deli. 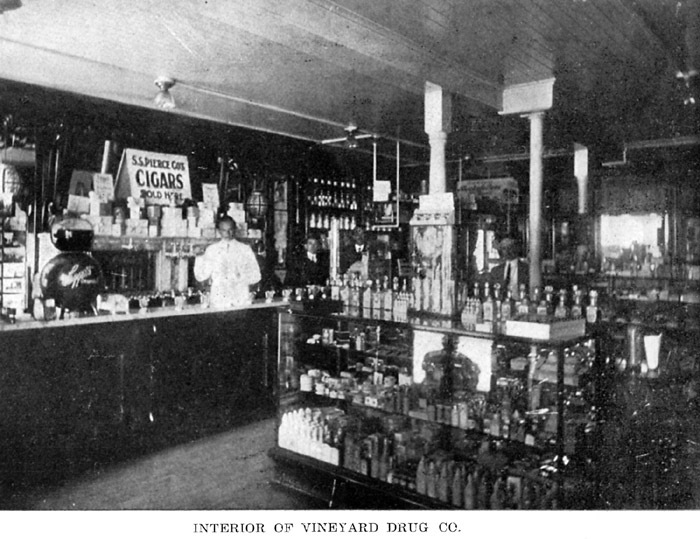 V. H. Terminal was in front of Tilton's Drug Store ("Yates"). 1920's. 35 cents each way." 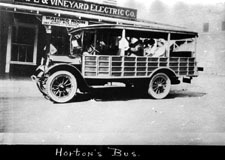 By May 1922, Horton's Bus Line was advertising in the Gazette. 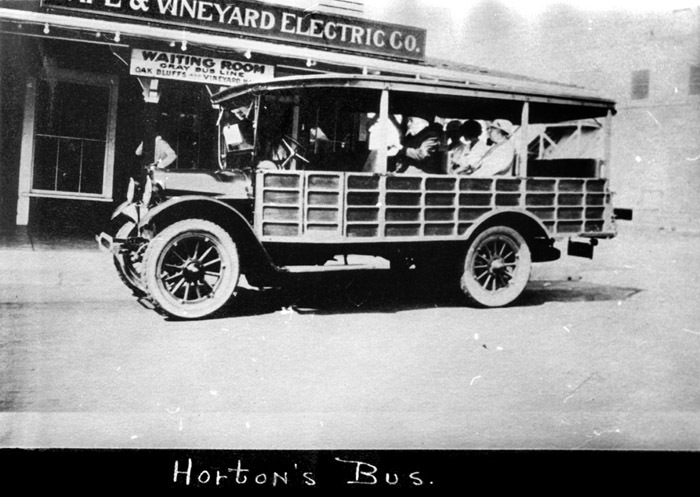 John Canha writes: "Horton's buses would park in front of Tilton's store. It ran between there and Oak Bluffs, a thrilling ride in those days. Our spring school trip to Gay Head was our annual thrill, riding in Horton's bus. Remember now that I lived in V. H. from 1915 to 1948, and remember things since 1918." Stan Lair said: "Harry Horton was noted for his house moving. He moved a heck of a lot of houses around on the Island, here, and later on he had a summer bus he'd run between Vineyard Haven and Oak Bluffs, leaving from in front of Tilton's Drug Store which is now Yates. Harry Horton's buses - he used Reos - left for Oak Bluffs on the hour, from in front of this drug store in the summer. Harry ran his buses there for a good many years. I believe he had about two of them, so he gave pretty good service there. That was after the trolley stopped running." Bertha C. (Tilton) Bumpus, Lester "Jack" Bumpus, and Bob West. Bertha Tilton (1891-1984), the daughter of Welcome Tilton, later married John P. Salvadore (1893-1949). Meanwhile, Lester Harwood Bumpus (1886 - 1925) continued the plumbing portion of Tilton's business. Ads for "Bumpus the Plumber" appear in the 1920-22 Gazettes. And the January 1920 census lists Lester H. Bumpus as a plumber with his own shop. 1923 ads list Bumpus offering heating, plumbing, and lighting, and in 1924, household ranges. In August 1925, Bumpus drowned in Vineyard Haven Harbor. SL: Jack Bumpus, Mr. Bumpus. He died in 1925. He was drowned when a group of people went out on a speedboat called the Jazz. And the steamer coming in, they hit a swell, they flipped him right out of the stern and Jack was thrown over and he didn't know how to swim and he went right to the bottom. Anyway I worked for Jack Bumpus for quite a few years. He was a good boss. When I first started plumbing. I was his helper on a good many jobs. He had one daughter. What's her name? Lives on Center Street, there. Bertha, "Doody." Named after her mother, her mother was Bertha, too. He was a good plumber. He was also at that time he did all the work for the water company, putting in water mains. 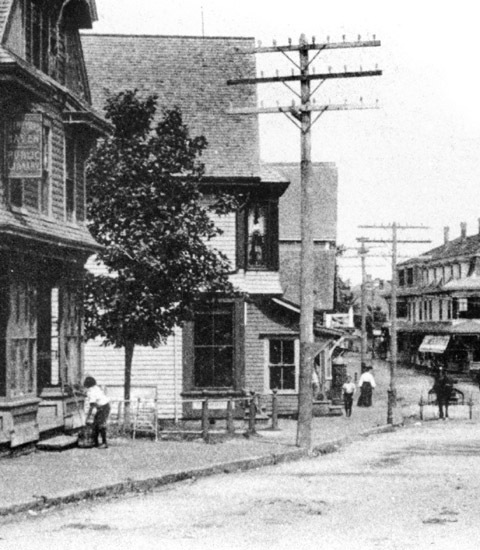 He'd hire all the fellows up on Pine Street there, and Summer street, to dig the trenches. That's how I got to know a good many of those fellows. And after he died, his business was, first it was bought by H. N. Hinckley, who ran it for a little while and then he sold it to Jack Hughes, and then that was the end of that plumbing shop. BW: Well Jack [Hughes] had a business in Oak Bluffs, also, didn't he, and he just incorporated the whole thing and ran out of Oak Bluffs. SL: I guess so, yeah. BW: And he just closed down over here. "With a number of boys, ranging between 11 and 14 years of age, and four other men, Mr. Bumpus went out for a spin in the speedboat Jazz, owned by Harvey D. Gibson, a summer visitor from New York. "Mr. Gibson was not in the boat, having instructed his yacht captain, Joseph D. Gray, to take the party out. Just clear of the breakwater, the Jazz met the steamer Pequot coming in. The speedboat struck the wave thrown up by the steamer's passing, and rolled far over, throwing out most of her passengers. "Mr. Bumpus was the only adult who had no knowledge of swimming, and before it occurred to anyone that he might need help, he had gone down. When the boat came about and picked up the rest of the party, he could not be found. "Capt. Gray saved two of the children who could not swim. Engineer Billings saved one child. The captain stayed in the water until everyone saved was back on board the speedboat. "The entire fishing fleet, assigned by the coast Patrol boat 280 dragged for the body the greater part of the night, and a seaplane from Newport was sent for to aid in the search. The plane was not used, however, as the body was recovered about 7 o'clock Sunday morning by Capt. Frank Canha. "Despite various reports to the contrary, death was caused by drowning, no marks or cuts of any kind having been found on the body." 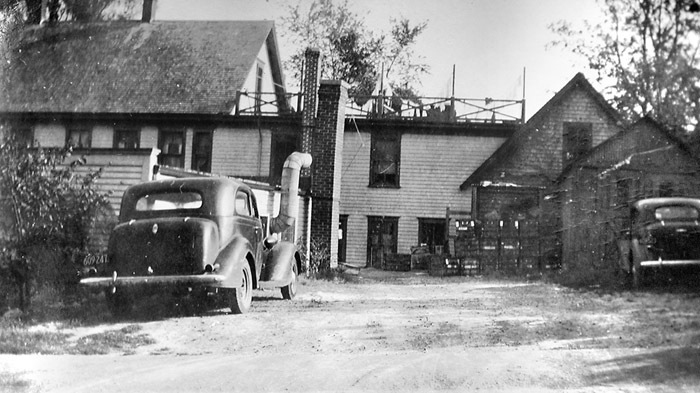 In October 1926, Sanitary Plumbing and Heating purchased the business of Hinckley Plumbing & Heating Company, Inc., "successors to Lester H. Bumpus, and doing business at the same location." This company was run by J. H. Hughes ("established in business since 1910") at Circuit Ave., Oak Bluffs and Main Street, Vineyard Haven. Stan Lair talks about his early jobs: " I worked up at the Makonikey brick yard, when they tore that down. That'd be about 1917-18, along through there. I worked up there one summer. I worked over on the Woods Hole wharf one summer, catchin' lines and lockin' boats, and that sort of thing. I guess my first real job and when I started what eventually wound up to be my career, which was plumbing, was I went to work for A. C. Tuckerman for one summer. 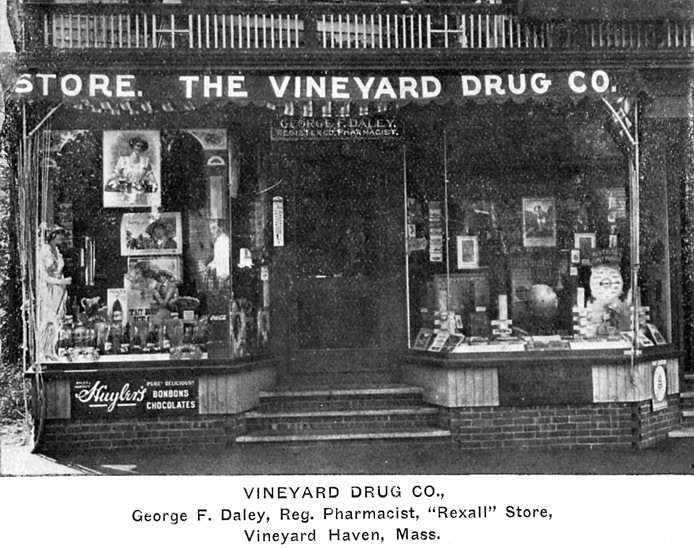 Then I went to work for Lester Bumpus, who had a plumbing shop right in back of Vineyard Haven drug store. And I worked for him until he was killed, drowned, then worked for H. N. Hinckley who ran it for a little while and then Jack Hughes for about a year. That's when we quit and I went into business for myself. Had a little shop right on Drummer Lane, that little old barn that's going down the hill on Drummer Lane. There for a long time, then finally the war came along and we quit. I went to work for Mr. Van Riper who's building boat models, ship models." "Big Hutch" was born in Lancaster, MA. He came to the island as a young boy, and lived first in Oak Bluffs before moving to Vineyard Haven. 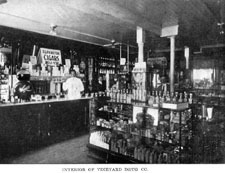 He was employed at Tilton's drugstore for 27 years, and remained with the business after it became Yates. Toward the end of his life he worked at Leslie's Drug Store. It's unclear who "Little Hutch" was perhaps his brother Alby, or possibly his other brother Vernon L. Hutchinson. BW: Well, they worked in what is now Yates Drug Store at that time it was Tilton's Drug Store. 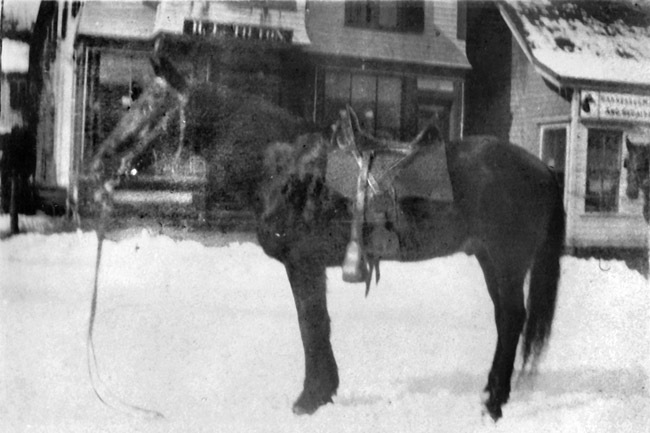 Big Hutch was married to the daughter of Elmer Chadwick, who was the fire chief in town here for many, many years and was a blacksmith. He was a great fire chief he didn't have a car, and couldn't drive a car, so we always had to go and pick the fire chief up and take him to the fire. But anyway that was Elmer Chadwick, not Hutch. Hutchy was a nice guy. He was a big man. He was heavy, fat that's why they called him Big Hutch. Little Hutch was shorter and not quite as fat, and the two of them made quite a team in the drug store. SL: Big Hutch was pretty light on his feet, though he was a good dancer. He loved to dance. He'd go to all the dances. BW: He was a nice guy. SL: And he liked sports. I remember the first World Series that I ever heard on radio was down there at his drug store. Hutch had a pair of earphones clamped on his head. And he was relaying everything they said over the air to the people who were standing around - which is quite a thing in those days. BW: He worked there after George Yates bought the store, too. If Big Hutch liked you Little Hutch didn't do it very much but if Big Hutch liked you, and he always liked me, he always found a way to put a scoop-and-a-half to two scoops onto a cone for a nickel or a dime or whatever the price may be, and as long as George Yates wasn't watching he'd do it. Nice guy. By 1928, Tilton was advertising candy, cigars, and fountain drinks, and was one of three Vineyard Haven agents for Mosher Photo. By this year the Gazette reported that he had three assistants, including Big Hutch. One May 1933 Gazette article makes reference to slot machines at Tilton's. In June 1935 they advertised candy, confections, tobaccos, "proprietaries," and sick room supplies, and in 1938 they advertised fine candies, toilet goods, sick room supplies, proprietary remedies, cigars, tobacco, and smokers' supplies. The April 1938 the Gazette makes a reference to a new "modern storefront" at Tilton's. By 1938, H. L. "Bert" Tilton had evidently retired because of his failing health, although the store continued under his ownership. Ralph Look notes that Herbert Tilton "set up" George Sears in the fish market business in the Union street building behind Issokson's (see Site #5), probably in the 1930s, which was later taken over by Ralph Look. 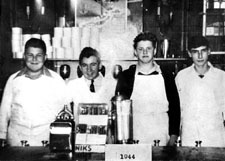 By 1940 Tilton's was advertising its soda fountain, cosmetics, smokers' supplies, and confectionery. 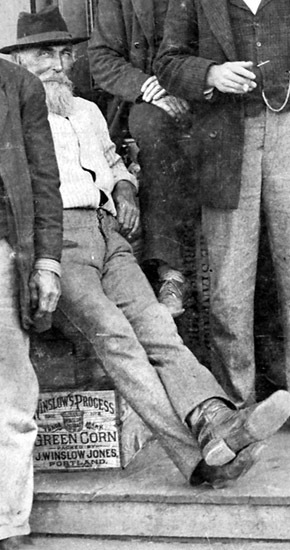 Tilton's assistants at this time were Big Hutch, Little Hutch, and Joe Andrews. Natalie Cottle and Dave Cryer also reportedly worked at Tilton's. Tilton sold his business in 1944, and his 1948 obituary noted that "Everyone [was] his friend. His life and general conduct were noticeably quiet and subdued, and though he was most genial as to disposition, he lived much by himself"
In March 1944 Herbert L. Tilton sold Tilton's Drug Store to George R. Yates, Ph. G., of Fall River, and the property was simultaneously deeded to Mr. Yates' wife, Margaret A. Yates, the daughter of Capt. Armindo J. Pinto of Vineyard Haven. 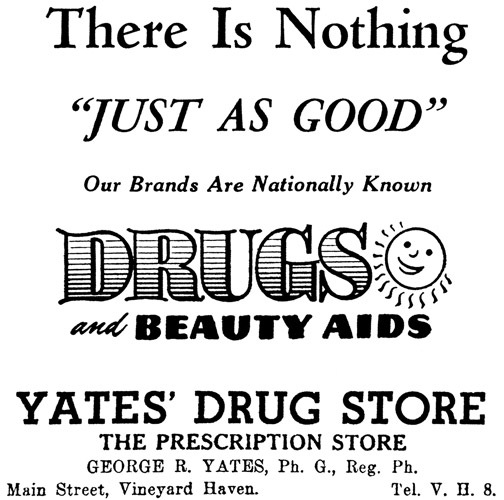 Unlike Tilton, Yates was a registered pharmacist, so the store became both a drug store and a pharmacy. Yates and his family moved into the apartment over the drug store. In January 1945, "Big Hutch" returned to the drug store under its new ownership and became the first soldier from town to return to his pre-war occupation at the war's end. In December 1945 Yates announced his plans to remodel and expand. That winter the basement was enlarged to cover the full size of building, and at the same time Yates remodeled and redecorated the interior. He moved the rear wall back, covered the floor in linoleum, and installed a new soda fountain. In February 1946 the entire structure was lowered two feet the store that had previously been three steps above the sidewalk was now even with it. Seamond Roberts writes: "Yates Drug Store. This place was a noontime treat for we kids and we knew that if we wanted to be re-admitted the next time we went for an ice cream soda, we had to behave. It always had that vitamin smell in there and I remember the floor that had those octagon-shaped baby tiles. The display counters were "just so," and Mr. Yates was a very cordial man to even we kids. However, because he was so strict (to we kids in our perception), when Leslie's opened, 99% of us went over there for our soda fountain needs. My parents, however, when they had to have a prescription filled, they preferred to use Yates, although I don't know why - maybe because he was there first. Yates' was also where the "drug store cowboys" hung out to watch the girls. I don't think they ever frequented Leslies for some unknown reason." 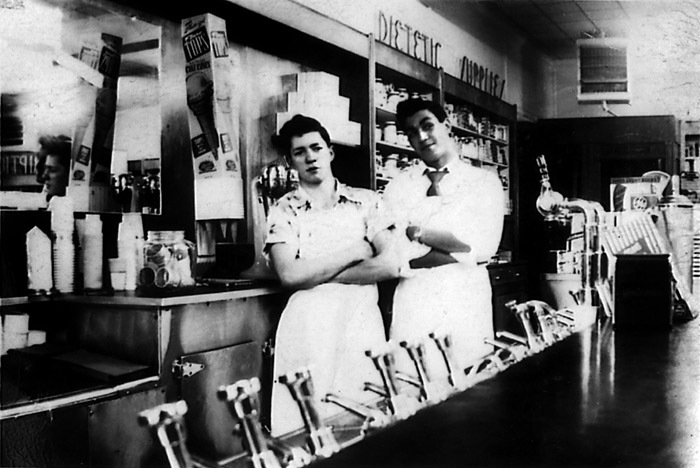 Joe Leonard and Bob Tilton, Yates' Drug Store. Dr. Russell Hoxsie writes: "George Yates was one of the first people I met in 1955. I remember his sweeping the walk in front every morning. Gruff, appeared humorless at first, but watch out, he could fool with you. Hung out in the back room up two or three steps from the main floor. There he put up his prescriptions. I think his calls about my handwriting made me see to penmanship at an early stage in practice. Dr. Mitchell was a great friend of his and they chinned every afternoon in the back room when Ralph finished office hours. There was a long soda fountain along the left side as you came in. David Cryer was the fountain man, and a man named Hutch (?Big or ?Little) I don't know. Finally store was remodeled and the fountain was lost for good. Mrs. Yates, Margaret was a wonderful woman, warm and always helpful." In September 1981, George and Margaret Yates of Boynton Beach, Florida sold the property to Jon C. and Ann K. Nelson. George was retired and living in Falmouth in 2001.